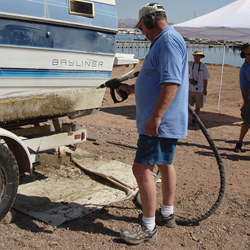 A person demonstrating a way to clean a boat after being in infected waters. Bureau of Reclamation Commissioner Brenda Burman announced the award of a $185,000 grant to the Colorado Parks and Wildlife for enhancement and further roll-out of a watercraft inspection and decontamination database. Federal and state inspectors use the database to track watercraft decontamination activities occurring at lakes, reservoirs and related waterways. These watercraft inspection and decontamination activities are being conducted to help prevent the spread of quagga and zebra mussels and other aquatic invasive species. The grant to the Colorado Parks and Wildlife is part of the $4.4 million in funding announced earlier this year to combat quagga and zebra mussels in the West. Learn more about how Reclamation is addressing invasive mussels at http://www.usbr.gov/mussels.